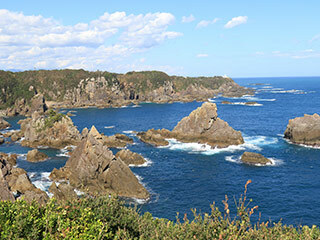 Umikongo Rock (海金剛) is one of the scenic beauty located in the south end of Wakayama Prefecture. These unique rocks are formed by the lava and erosion by sea wave. There are so many types of rocks, such as pyramid, doom and others. 1. use JR Kisei Line to Kushimoto Station. 2. use a local bus to Kashinotodaiguchi. The rugged landscapes here were formed of igneous rock being eroded by the wild waves of Pacific Ocean. The continuous weathering processes along cracks in the different rock types result in some being round boulders, while others are tail columns.